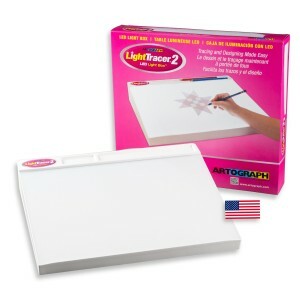 A versatile art projector for the novice to experienced artist or crafter, and Artograph’s® bestseller. The Tracer® enlarges any design or pattern onto a wall or easel from 2 to 14 times the original size. Projected image can be easily traced and colored as desired. No set-up necessary and simple to operate. Darkened room required. 110V US/Canada Tracer comes with a 23 Watt CFL light bulb included. 220V International Tracer comes with a LED light bulb included. Recommended replacement bulb is a 1600 lumen LED bulb (100 watt-equivalent – do not use an incandescent bulb in the Tracer). More info in our Knowledgebase. This entry was posted in Projectors, Tracer Series and tagged projector, Tracer, Tracer projector on April 8, 2014 by Artograph.